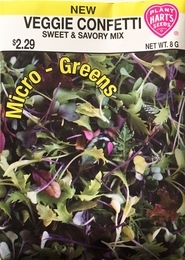 Our "Veggie Confetties" (AKA Micro-Greens) are a mixture of mild sweet greens (and reds) with a few peppery additions. Easy to grow indoors or out, any time of the year. These nutritious stems and leaves are not sprouts; the seeds are planted in soil and your harvest begins when the seed leaves and first true leaves of each plant appear. TWO cuttings are likely! 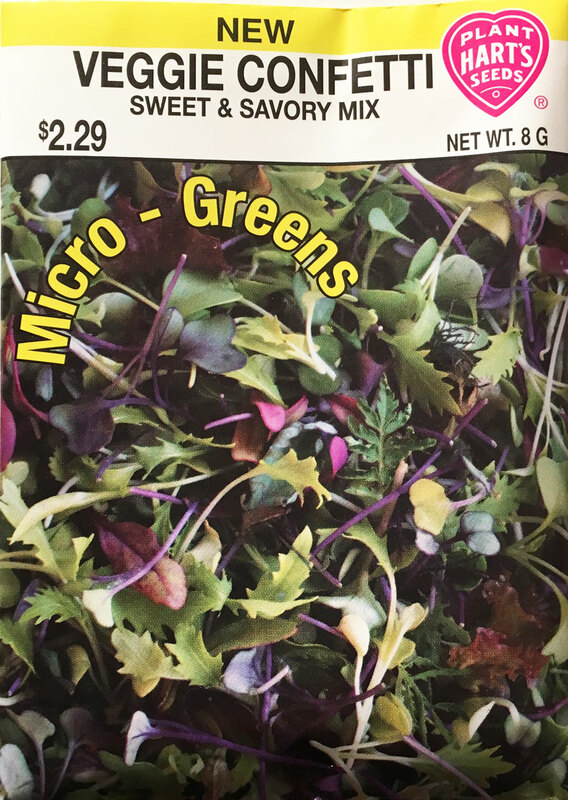 Our unique combination of red/green leaf lettuces (25%), blue/red kale mixture (15%), red/yellow chard mixture (15%), Bloomsdale spinach (10%), Arugula (10%), Early Wonder beet (10%), Radish mixture (10%), plus herbs (gem marigolds, purple basil and summer savory 5% total). Germinates in - in under 10 days depending on the soil and weather conditions. Seed spacing - these baby plants can be sown very close together - seed to seed, scattered or in rows. Thinning - none needed. Just cut the baby plants at the soil and add as a crunchy topping to your favorite sandwich.